Lazies, I have a new product to share with you today, and a clue for the ones I’ll announce next week. 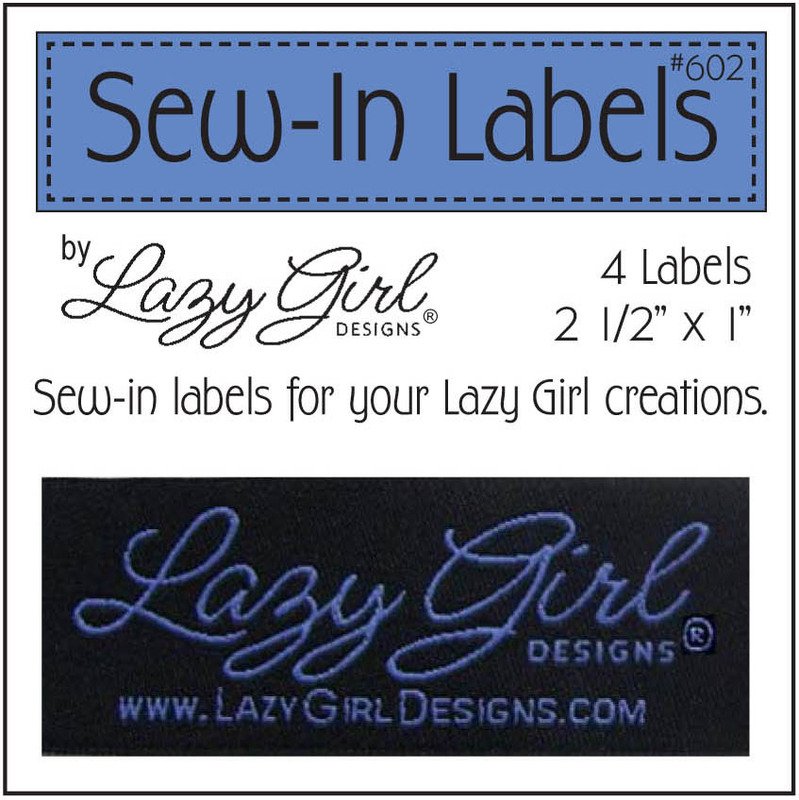 Brand new to Lazy Girl Designs is our sew-in label. This is the first item to sport our new logo, too! Thank you to all who posted lovely comments about the new logo! The sew-in label is due to the requests of the Lazies in my Yahoo group. 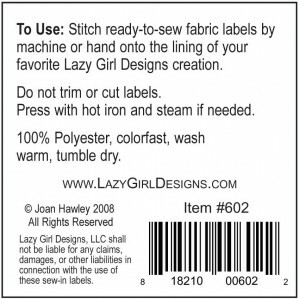 The Lazies wanted a nice, woven, custom label to sew into their Lazy Girl creations. They asked, and who am I to argue? We went through a number of design ideas and options including sew-in, iron-on, different lengths, shape, etc. Going with the majority, we settled on a simple label that can be stitched in place. Ideally, the label is designed for use on the lining of a bag creation. But, you could sew it anywhere. 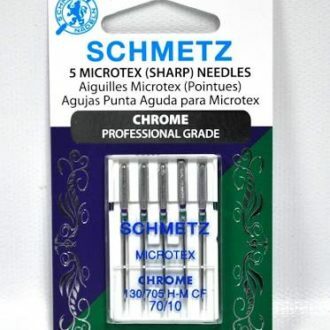 4 labels to a pack with a suggested retail of $3. Size: 2 1/2″ wide by 1″ high. Black with periwinkle double-stitched text. These just came in last week, so they may not be in stock yet at your favorite store. Compared to the physical size of my patterns and other products, these labels are tiny. 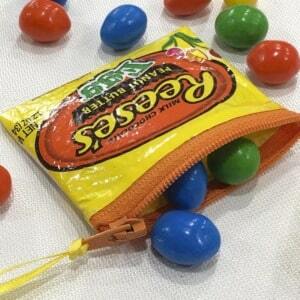 They fit inside a 3″ x 3″ zip top plastic bag. Looking at a whole pile of them – they are just about as cute as can be. Post a comment by the end of the day Wednesday May 7, 2008 and I’ll draw a name to win a package of the new Sew-In Labels. And if you have any tips for working with sew-in labels, please put those in your comments. Thanks! I’ll edit this post with the name of the winner later this week. Lazies, I’ve been working on a new product line for the last five months and I expect to unveil it next week. If you are heading to the International Quilt Market in Portland, OR, this month, ask your favorite distributor to see samples. While I am not attending the show, the new products are. And be sure to check out the ‘In The Bag’ SchoolHouse session by Susan Fuquay of American Quilt Retailer before the show – she has samples! 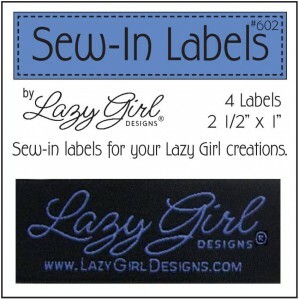 Lazies, Donna from Littleton, CO, was selected to win the Sew-In Labels. Congrats Donna! I think they are so cute and will be great to put on my purses. I love all of your bags and these are a great addition to add to them. What a great idea….sew in labels….and looking so smart! Congrats! Love the new sew-in labels. I just absolutely love your new logo designs – especially the periwinkle color! My guess for your new product has to be purse HANDLES! What else would be so handy and come in 10 colors! Best of luck to you with your new products. I am so excited about these little goodies! I will be making a couple purses this week just to put them on and take pics for the web-site! I think this is a fantastic idea. It will add to the professional look of my bags and let everyone know that I am a “Lazy Girl”. I’m sure you picked periwinkle because you knew that blue was my favorite color. I think that you are one of the few designers that are really in touch with what your customers want and also you really try out and use the products that you recommend from other manufacturers/designers. I know that if you recommend a product, that you have used it and know just how it works. As for the surprise, I would guess “ready made handles” in ten colors. HANDLES! OH boy, oh boy, oh boy! Handles that are not , uhmmm, diplomacy, diplomacy, not so beautiful or bamboo. Oh what a treat!’ I sure do hope I’m right!. I like the idea of labels…I may need to check out this yahoo group…. I am just getting started and I think the labels will be a wonderful asset. Joan, I absolutely love the idea of labels. I made the Sassy for my granddaughter, and she wanted to know what happened to the label. Now I can tell her that all future bags will have labels. Thanks for reading my mind! Great idea on sew-in labels. 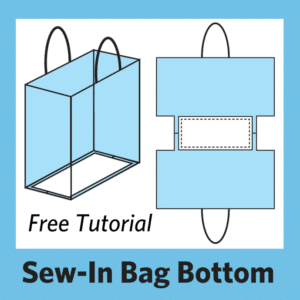 Consider sewing the label in place before constructing the bag. Good luck. WOW…what a great idea. I love it and the color as well. I shall be ordering some soon…like TODAY! I hope the new product is Handles in 10 colors also. HAS to be! Also a GREAT IDEA! In todays world of “designer” tags these labels are perfect! I have a City Bag almost finished and a Gracie waiting in the wings that are both in need of these…Cant wait to get my hands on some 🙂 Thanx Joan!!! I have MANY of your purse patterns and hope to start actually making some of the Runaround Bag ones soon. Those labels would definitely make anything I make of yours more professional. Good idea and I LOVE the color(s)/Font of the label also! Can’t WAIT to see what your surprise design is soon! I love hearing your guesses about next week’s debut. I can tell you it’s not handles, though. I love the idea of sew-in labels! I usually make labels of my own to put in my creations, but I will use yours for my Lazy Girl Designs! Love the labels! The perfect touch of class! …..perhaps the new “thing” is the bag lining, or ready made “Pockets” to put inside the bags!! ….another idea……… is it little matching notebook, with a pencil attached??? Perfect use of the new logo. 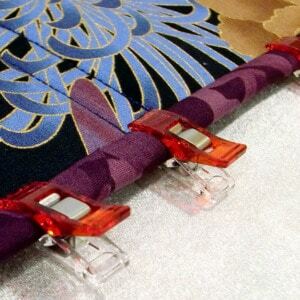 When I use sew-in labels, I use a small piece of fusible web on the back of the label to iron it in place. Then I can just quickly hand stitch around it while it’s held steady. If not handles……well…….maybe some dimensional embellishments? Oh my goodness! Labels! That is one great idea! Order will be coming… I can hardly wait for the new line. I love anything you do. Especially the WW! My guess would be fabric !!!! Or preprinted foundations for the patterns, it will do me in to wait this long!!!! Thanks Joan for the new labels. They look beautiful and very professional! I’m putting mine in the side seam on the outside of my bags. I want a nice suppply for all my lazies in my classes! Boy, if it isn’t handles, I am befuddled….? Key chains? Make up bag? (but we could make one of those to match, right, girls?) leather wallets (I will not attempt one of those, so that might be cool). Cell phone covers…tiny notebooks, calendars…am I getting warmer yet Joan??? Can someone please figure out how to clone me so one of me can always be doing fun stuff??? Could it be that we are going to be BLESSED with some lovely PURSE HANDLES! oH oH oH, I can’t wait! You’re the best Joan!! Lovely idea and it has motivated me to make up a few for myself on the embroidery machine, with my own name on it which could be stitched in the bag somewhere. It would have to be in a nice place that did not need its own measurement. But big bags in particular seem to be left when clearing up after a day of sewing, and a personal name in them would be great. The designer’s name would be the one that added class! LOVE the labels!!!! They’re fabulous!!! I really thought it would be handles. BUMMER!!! 10 colors…10 colors… I’m stumped. If they’re HANDY… Gosh, I’m stumped!! Yay!! I can’t wait for my favorite vendor to get hers in. Thanks for taking the time to do this Joan! The labels will had a touch of class. Thank you!! Great idea! Love the new labels! They will be great in all my new purses. I’ve made 6 Miranda’s and LOVE the pattern! You just never stop amazing me! Thanks Joan! What a perfect finish for my bags and wallets! Love your new logo and can’t wait to get my hands on the new labels. I’ve made either a Runaround or Sassy Bag to match my vests (I wear a lot of vests) and labels would add just the finishing touch. Thanks, Joan, for all your wonderful designs. Just purchased “my favorite duffel bag” and can’t wait to make it. I have almost all your purse/tote bag designs. Nice looking label! I have been a fan for a long time, the wonder wallet is the first pattern I bought, and I immediately started looking for more of your great designs. I like to sew a label into the inside seam of purses, near the bottom or middle of the side. 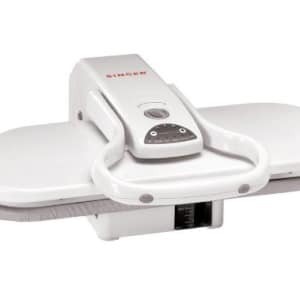 It is easy to incorporate as you are stitching them up. love the new logo as well! As always, you have a clever and beautiful idea. Love the new logo, too. Love the labels! What a great idea for the finishing touch of your wonderful bag. Thank you for thinking about your loyal “lazies”! I love these little dudes. My question is though for those who plan on sewing them into the side seams, is there enough of a border around the text to do that? It doesnt look as such, but I plan on stitching them down on the lining anyway. I think I know what the coming up things are, it might be RELATED to handles…? Very classy, smart looking label! I’ve already ordered mine — can’t wait to sew them into my future Lazy Girl bags! Nice labels and logo. I get comments on my purses at the checkout whenever I am getting ready to pay, they always like the unique fabrics I’ve used to make the bags. Love the labels and do plan on getting some soon. 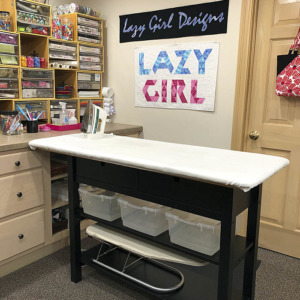 Just wish there were a way to get a “price break” on quantity, because I would love to be able to give one to my students when we make a Lazy Girl pattern in the Bag Lady Club I teach. Thanks and looking forward to the “other” news too. I’ve recently become addicted to your patterns. I’m so excited there will be labels to put inside of them. I’ve been making them for gifts. LOVE, LOVE, LOVE the new labels. See you at Quilt Market to place our order. Also, your Miranda Bag is almost sold out in Flutterby fabric. Thanks so much and can’t wait for your newest and greatest. I love your new label Joan. Looks great! A nice way to add “designer” status to our individual bags. I just figured it out! I’ll bet it is zippers!!!!!! Lots of pretty colors I hope! Cool labels! A wonderful touch of class! You’ve done it again! More goodies for us Lazies! The labels look like just the right size to “brand” a bag – not too big to be loud 🙂 I can see them settling nicely inside, making the bag look very designer… Can’t wait to get some! Now, your next goodies, are they handles? I can’t find any nice handles locally, only those bamboo ones. They just don’t do it for me..
Love the labels and have some ordered!! but not above winning some!! love the idea of labels — the American Sewing Guild has some, and we use “wonder under” to attach them. quick and easy. I love the design of the labels! Joan, the new labels are perfect. They show your new logo off and adds a finishing touch to a new purse project. Thanks for all your hard work. Can’t wait to get some and show to the ladies that are in my Bag Ladies class that I teach in the shop I work in. Of course we use many LAZY GIRL pattern. We just really want to socialize and make bags the easy, LAZY GIRL way! I like the labels. They are very neat, but what I really liked, and haven’t seen are the Lazy Girl plastic charms to go on zipper pulls on the Lazy Girl purses. These were given out a few years ago at a Lazy Girl program, to anyone who had a lazy Girl purse with them. I got so many comments on the charm. I would be interested in purchasing these in metal or plastic. The labels look really neat. The logo really adds a lot also. I plan on getting some. The labels reminds me of designer Vogue patterns several years ago that included a label. Very classy! It will be an honor to put that label in all my Lazy Bags. i bet the new product is handles. now about the labels, i love them. Can’t wait for my labels!! But that hint for next week, gosh don’t know if we’ll survive!! Very cute! Please put me in the drawing! I really look forward to my labels….now I will be able to really “finish” my lazygirldesign bag! So professional! Pam….a true lazy girl! Thank you Joan! They are really sharp looking – and will convince some of my pickier gift recipients that Aunt Bobbie didn’t make our Christmas presents this time! Sixty-eight people have already said it, but I want to be sixty-nine: These are way-freaking cool! Can’t wait to see the new labels. Need to get busy and make myself a new Town Purse for summer. 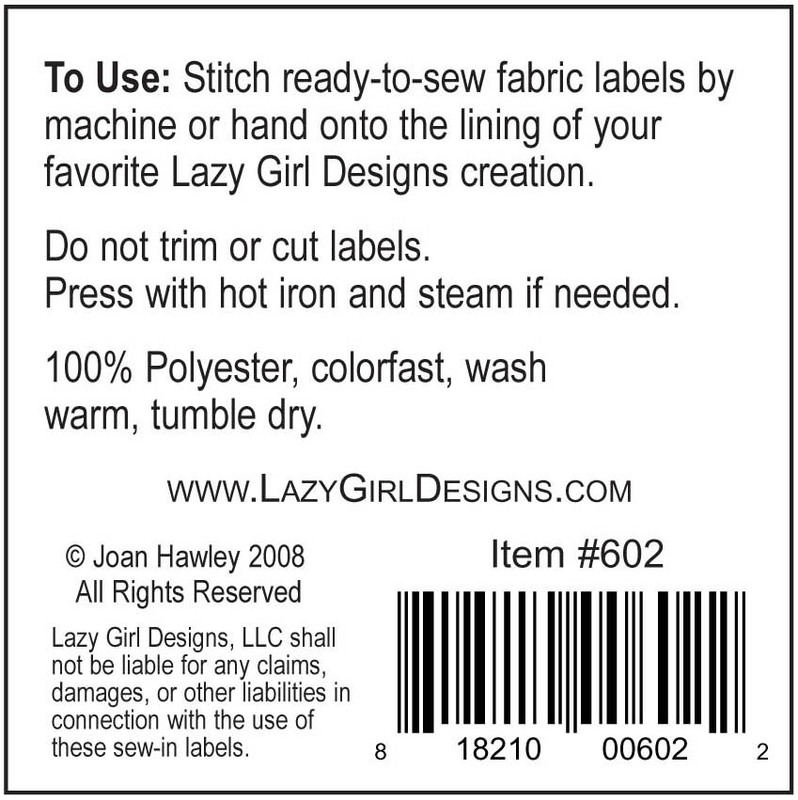 Joan – I can’t wait to get these awesome labels to sew into my Lazy creations! What a great idea from a great designer!! Hmmm, next week’s reveal? Whatever it is will be great, no doubt. Thanks again! Well, these will make the bags look really “official”. Another great idea! I just completed my second Miranda bag; a label would make it even better. I have 3 Miranda’s cut out…I’ve been to ‘skeered’ to start them…but everyone assures me they will be easy…so now i need the labels to go in them. Love the Lazy Font and the Cool Periwinkle Blue…LOVE LOVE LOVE it! Your stylish labels are the perfect addition to the Lazy Girl bags. They are on my to be ordered list. I can’t wait to see all the creative way Lazies will find to incorporate these labels in their bags! Knowing their creativity, it won’t be “just” sewn in!! Such cute labels! Very professional looking. Can’t wait to see what your new line is. Purse Laels! What a great idea! We label our quilts, so why not our purses?!?!? I have most all of your purse patterns. How about a new purse pattern soon? I love the new lables! If it’s not handles (hee hee, I know what it is) you better get busy from the posting I read above. the labels are so cool. when i am making an article of clothing or purse, tote, etc. 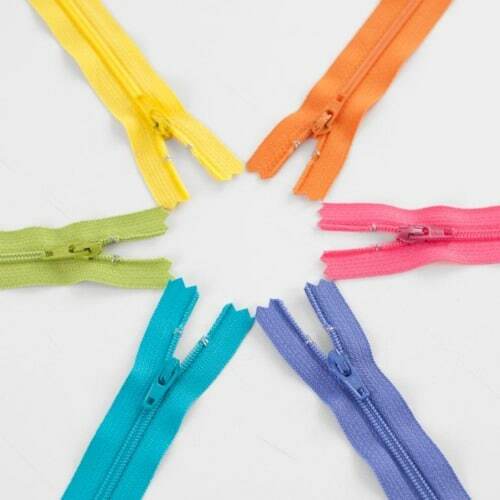 i take small scraps of the material used and sew them into a strip with a button hole. i have sewn a button in each of my purses and when i am at the fabric shop it is so much easier to just reach in and unbutton my fabric swatch than to search through the bottom of my purse where the swatch normally falls. I love the labels. I always label my quilts with a handmade label that I design myself. I have “hand made especially for you by…my name…”labels, but these are so much more professional looking. Great going. Like the labels! It’s always good to add a label. Just adds an additional personalized touch. My first thought was new handles/straps also in colors to match fabrics too but…..maybe the ‘purse’ zippers in colors other than black/white/navy/natural??? I love the purse zippers with 2 sliders. That would be great!! Maybe even some with each side being a different color. 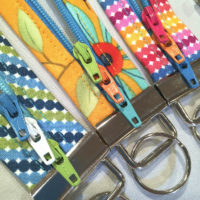 That would be easier than buying 2 separating zippers to make 2, 2 color zippers and still only have one slider. Another thought might be baggie bottoms in colored plexi? Love your new labels, great colors. Another winner, Joan!! I’ll be keeping my eyes out for the labels, and then likely break down and order them. I can be so impatient. 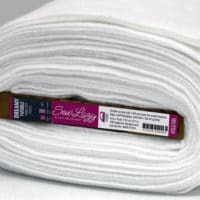 If we are good and buy lots, would you consider making a smaller, one to be sewn into an outside seam? Sort of like what Levi jeans have on their back pocket, so folks could tell without looking inside out bag that we are fellow Lazies? Please??? (and thank you). Joan, this may be it! 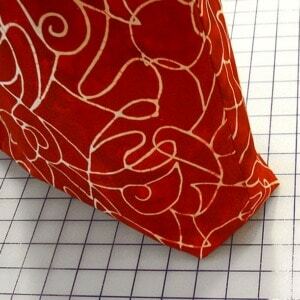 I have had my Newport Tote pattern since Rita’s Quilt Away 2 yrs ago…and have not taken the leap of faith to cut the fabric to make it. I have the insert, too. Now you’ve enticed me with a darling label…perhaps I should hold out until September and you can really show me how easy it is!!! That would be too cool! Joan, I always look forward to your emails each week. Congrats on the new sassy labels. I am a fan of your patterns and have made the sassy bag but purchased more of your patterns to make.